Spend the day at Pigeon Forge’s upside-down building, WonderWorks! With more than 100 hands-on exhibits, an indoor rock climbing wall and a ropes challenge, this is the place for interactive fun. Jump out of bed and sprint to Dollywood for a day of fun and thrills! Take your choice of more than 40 rides and attractions and the latest roller-coaster, Wild Eagle. Slide on over to the Dolly’s Stampede and fill up on a four-course meal as the North and the South compete against one another. Then round off the day with a game of blacklight golf at MagiQuest. Go aboard the Titanic, for a self-guided tour of more than 400 rare artifacts and experience the stories of the ship’s passengers. For lunch get some slices of pizza at Mellow Mushroom or dig in at Blue Moose Burger & Wings Family Sports Grille. Have dinner at Five Guys Burgers and Fries then catch a movie at Forge Cinemas or take a spin on go-carts at the Track. 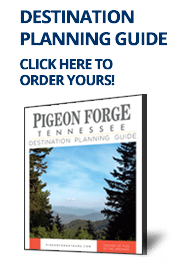 *During a summer visit, include a day at Dollywood’s Splash Country, a whitewater rafting trip, or a hike into the Great Smoky Mountains National Park.